Ada was extremely kind, understanding and really welcoming. I felt comfortable the entire time and will definitely be returning.I would recommend her to anyone! Also - the support staff were helpful and so kind as well. A+ all around! Ada was extremely kind, understanding and really welcoming. I felt comfortable the entire time and will definitely be returning. I would recommend her to anyone! Also - the supportstaff were helpful and so kind as well. A+ all around! I had been looking for a doctor around my area and I’m so glad I found this one. Very helpful andconvenient. I had been looking for a doctor around my area and I’m so glad I found this one. Very helpful and convenient. 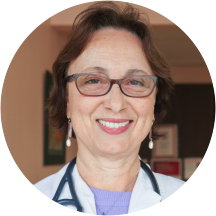 Dr Rivero-Yamuy is one of the top Family Practitioners and Primary Care Doctors in Southern California. Dr. Rivero-Yamuy is extremely attentive to detail and always goes out of her way to make sure her patients feel comfortable and are taken care of properly. Feel free to book an appointment anytime! Ada del Rivero - Yamuy, M.D. I loved how I felt like I was at a family’s home when Dr Rivero came in the room. I liked her right away, a very caring aunt vibe. The building itself is modern& very clean. Parking is a little annoyingon that part of town but I would definitely come back. She was very sweet and caring. I highly recommend her. Convenient everything! street parking etc. professional nice office was seen immediately, she really took the time to listen to me and took thorough notes. So glad to have a new Primary Doctor! I think she is heartless and has an awful bedside manner. These are the kind of doctors that give the profession a bad name. Both doctor and staff do not care about their patients. The doctor says if you don't likeit just get another doctor. Once they've over billed your insurance of course. They do not care about your health. This is one of the worst doctors I've ever seen. If you care about your health AVOID this horrible doctor and office. I appreciated the service provided during my first visit as a new patient. A nurse practitioner student conducted a comprehensive intake process with me to learn about my health history and really took her time to understand my needs. She relayedthe information to Dr. Del Rivero-Yamuy who also took time to give me full information on each of my needs/requests for care. I am used to feeling like I need to beg doctors for an extra second of their time but she was calm, kind and caring and took time to make me feel heard. She gave very clear instructions and information and she was careful to explain to me which tests/procedures/medications would be fully covered by my insurance which I sincerely appreciated. She also has a sense of humor that I found endearing. Only downside to this office is parking--the lot for the medical plaza is expensive so I found street parking far away and walked. Arrive early if you want to do the same. Del Rivero-Yamuy was very kind and informed. My appointment was seamless and all my answers questions. Great doctor, very polite staff, and quick appointment. Although everyone was great, the office equipment is extremely outdated and is the only reason I would not recommend to my family and friends. Ada is nice but the office is a little basic and in need of some upkeep. Parking in the car park is obscenely expensive. Over $2 every fifteen minutes. Dr. Ada was great. Seems like a good doctor and would definitely recommend her. Didn't wait too long and was impressed with her level of care, both inter-personally and as a doctor. Staffs and Doctor are amazing and very professional. Overall, visit was a positive experience. I had a morning appt and was in and out within one hour. It was a little disconcerting that a nurse asked me questions regarding my medications etc in an open space and not aroom with a closed door. On a crowded day, other patients would have been able to hear our conversation. Dr. Ada is very friendly and professional. I am happy to have found her. I really had a very good experience with Dr. Ada Elena Del Rivero-Yamuy, but have not had a good experience since my visit. I have called and left messages trying to get my test results for a week, and no onehas answered the phone let alone respond to my message. Aside from this, Dr. Del Rivero-Yamuy was very sweet, straight forward and answered all my questions. She wasn't rushed and made me feel very comfortable. The office isn't the prettiest in the world, but I felt well taken care of. She is very unprofessional, and I highly recommend staying away from this office and this doctor. Diagnostic capabilities are still unknown but seemed to have a handle on my main concerns and handled my anxiety. We'll see again after she receives my tests. I continue to be impressed by Dr. Del Rivero-Yamuy. She's very attentive and alert, and so is her staff. She was AWESOME, she made me feel very comfortable as if I was an old friend . I will return for my next visit in a few weeks, looking forward to it . She was warm and very professional at the same time . Pleasant office and helpful staff. The office was busy this day but I was helped within a decent timeframe. Got in and out right on time with the information I needed. Thank you Dr.! She's fantastic and spends adequate time addressing issues and concerns. She very helpful and kind and I look forward to seeing her for my next check up. However the experience I had at the recommended laboratory- WesternImaging- following my first appointment, was hideous. I will NEVER go to WesternImaging again. Dr. Ada Elena was very pleasant, thorough, professional and efficient. He showed deep concern to get me well. Terrible customer service. You can't reach anyone by phone. Wow, I was a little shocked at how kind and courteous everyone including the Dr Ada was. I felt listened to and definately very well taken care of. I'm very happy that I'm in good hands. That explaibs why the office is busy. Dr. Del Rivero-Yamuy, and staff was very pleasant and professional. Office is clean but small. THE GIRLS IN THE OFFICE ARE AMAXING, JUST FULL OF SMILES AND VERY CAREING AND PATIENT. I WAS IMPRESSED AGAIN------------- LADIES AND GENTLEMEN IF YOU NEED OR ARE SEARCHING FOR A DOCTOR PLEASE DO CALL HER OFFICE OR SCHEDULE WITH ZOCDOC.I WAS SEEN IN A TIMELY MANNER TODAY BY DR ADA'S ASSISTANT AND WAS VERY PLEASED WITH THE LOVING CARING ATTENTION AND KNOWLEDGE THAT II RECEIVED. The doctor is a wonderful woman, attentive, detailed and good listener. She feels you intuitively and takes care of the problems right away. I came in for a broken finger and got a referral for an x-ray. The x-ray results were faxed over the following day (Jan 22). I called the office EVERY DAY multiple times from Jan 26-Jan 28. No one ever answeredthe phone and none of my calls were returned until the morning of Jan 30 stating they can't find my x-ray results. Just got off the phone with the x-ray office and they re-faxed my results while I was on the phone with them. Just tried to call and again no one answered the phone. At this point, this is COMPLETELY UNACCEPTABLE to have to wait this long for something that was sent OVER TWO WEEKS AGO. I am irate and will be transferring to another doctor IMMEDIATELY. DO NOT go here for anything other than normal check-ups. They won't return your calls and it's impossible to get an appointment. That being said, the nurse practitioner who saw me was very nice and helpful, but whoever is running this office is clearly incompetent. She was great! She answered all my questions, and referred me to the specialists I needed to see -- who were also great! She has always given me the care and attention that i need. I booked a 9 am appointment so I wouldn't have to take too much time off work. The Doctor did not arrive at the surgery until 9:50 - the assistant told me she was stuck in traffic which I understand butwhen she arrived she did not apologize or even acknowledge that she was late in the slightest! She was really kind, very caring and took the time to talk to me about a couple things that she had noticed during my appointment besides the reason I came in, but wasn't pushy about it at all. She gave methe exact prescription that I was hoping for and had asked for a one time dosage. I was able to get my meds that day and was feeling better even by the next day! The only bummer was the long wait time, but with their little office, I guess they were probably shorthanded on staff. excellent caring manner and very gentle with my elderly mother who is fearful of going to the doctor. The staff is friendly and everyone is very professional. Dr. Del-Rivero-Yamuy is a very caring physician and has a warming personality. We had a short casual conversation, which made me feel like she sees me as a person, not just anotherchart record in her clinic.I am statying with her and amd glad I found her. J.S. She is a great doctor with a wonderful emphasis on patient care. I love Dr. Ada. She is a genuinely nice person. Her office could be best described as no-frills but she is a caring doctor who listens to her patients. I started visiting Dr Ada back when I had HMO insurance and had limited options. I have better insurance now but I keep going back because she's great.